The colour of the saree is blue in colour which suits for everyone and also attracted by everyone. This saree contains zari border with golden threads. parrot green, pink threads are attached on both sides of the border. And u can see green and pink flower zari woven elegant designer pallu. This saree is suits for party wear and also for traditional wear. If you are interested to buy party wear you can visit unnati silk. Unnati silks has widest varieties of ranges. .Different types of models we can find in Unnati silks like Casual wear, Party wear, Weading wear, Traditional wear. In Unnati we can find different varieties of sarees and dress materials, tops, dupattas also. Womens are usually interested on unique colour and models of wearing. Each and every type of models you can find in Unnati silks. 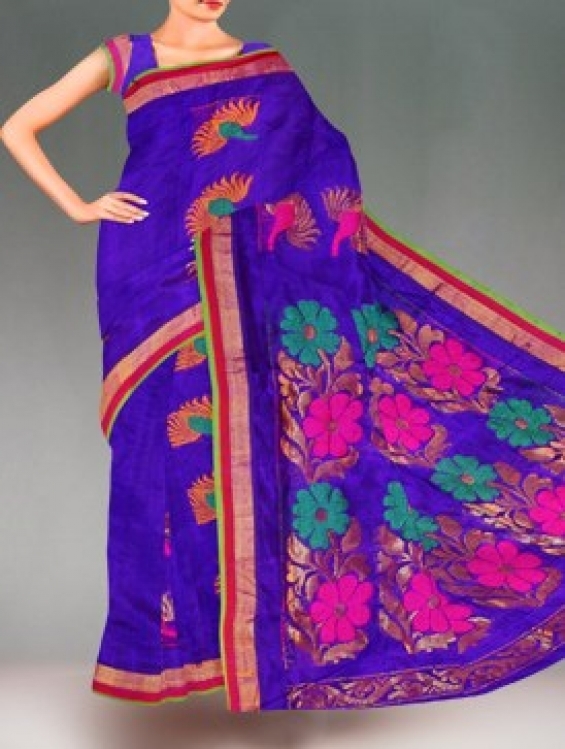 At unnati silks online products are very reasonable prices. Unnati silks dispatch the order within 24 hours.Unnati silks have free shipping and Cash on Delivery (COD) facility for Mumbai, Delhi, Chennai, Kolkata, , Bangalore,, Hyderabad, Ahmedabad, Bhopal, Lucknow, Jaipur, Patna, Bhubaneshwar, Dispur, Chandigarh, Ernakulam and many other Indian cities and towns. unnati silks do have shipping facilities for out of country also like UK,USA,Canada,Australia,Bangladesh,Srilanka and others. Return policy facility also there. You can buy the product online and also directly purchase by visiting unnati silks showrooms. #3-4-360, Vajra Complex, General Bazar (Tobacco Bazar), M.G. Road, Hyderabad, India.